The setting was Lombardi’s 1025 Club on Saturday, September 21, 2002, with about 350 people in attendance. The evening began with a cocktail hour and buffet table of Italian antipasto specialties. Members and their guest got a chance to taste various appetizers specially chosen by Frank Boffi chairman of the menu committee. Members and guests were also able to look back at their heritage in a display area prepared by Louis J. Spremulli chairman of the Heritage committee. Many members were able to bring back some memorable moments from old artifacts, pictures and historic literature. The festivities began at 6:00 pm and the master of ceremonies Peter Marinucci welcomed everyone to the celebration of the 90th Anniversary of the Young Pannese Social Club. Various dignitaries were present and special presentations were made to the Social Club. President Paul Sepe addressed those in attendance and spoke of how the Young Pannese Social Club came about. He spoke of the Club’s logo, a handshake signifying friendship to all. Also Paul explained how six musicians from Panni, and the struggles of our forefathers , immigrated to this country and formed a Pannese Society in the Federal hill Section of Providence. He also recognized all the past presidents of the Young Pannese Social Club, living and deceased. The audience applauded them for all their hard work in moving the organization forward to where we are today. The chairman of the affair Gus Bianco also addressed the body and expressed his gratitude to all his committee members, which represented total commitment and accomplishment in the preparation of this 90th Celebration. The president of the Womens Auxiliary, Eleanor Spremulli also expressed her congratulations and was applauded for her committee’s hard work in all the floral designs. Today the men’s club has about 100 members with a women’s auxiliary of about 60 members. 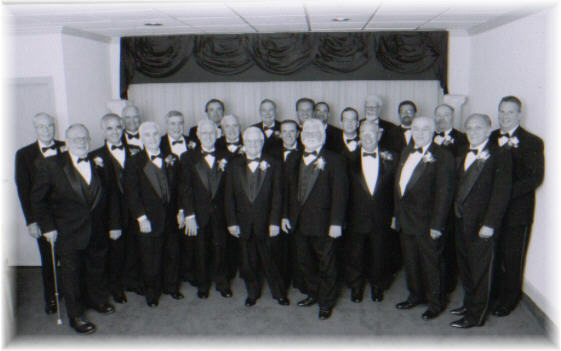 The Social clubs focus has always been to keep Italian Heritage alive with such functions as their Annual Thanksgiving Dinner, Dinners Dances, Bowling League, Golf Tournaments, and various other activities. Charity has played a big part of the Young Pannese Social Club. Donations are made to neighborhood youth organizations, area fundraisers, Charities and the Muscular Dystrophy Association considered their major charity. All guests enjoyed the dancing to the music of the Black Tie Orchestra. Everyone seemed to be enjoying the celebration. Family and friend were united once again, enjoying conversation of daily events, old stories, sports and whatever was on their mind. The atmosphere was very joyous, but various older members spoke of this probably being their last chance to enjoy such an anniversary. What was important was that the real meaning of the social club was alive and that three generations of members were enjoying their Italian heritage. The Young Pannese Social Clubs greatest accomplishment is its club facility in the Silver Lake section of Providence, R.I. The facility houses a restaurant, club quarters, and tenants. Many of the club members helped to refurbish the structure to a state of the art facility. Members can finally be proud of a facility, which was a dream for three generations. In closing, the Pannese spirit is alive all over the world. This can be experienced first hand by publications like the "Il Castello" a quarterly magazine published by Pietro De Michele from Panni, Italy. This newsletter reports on Pannese Heritage throughout the world. The Internet can take you to two home pages full with information about Pannese Heritage; http://www.info-lab.it/hirpus/index.htm and http://www.info-lab.it/hirpus/emigranti.htm. Speaking as member of this social club and as the Heritage Committee Chairman, I hope that this Pannese spirit can be used in making this world a better place, no matter what your heritage.